Fahrenheit 451 is set in future America, a dystopian, hedonistic, and post-literate society facing an impending war. Society loathes meaningful things and instead prefer to drive at extreme speeds, watch excessive amounts of television, and listen to radios that fit in their ear. Guy Montag is a fireman, government workers who burn the illegal and publicly denounced book. He enjoys his job until he meets Clarisse McClellan, his new neighbor. She opens his eyes to his true self and causes him to question his life and perceived happiness with seemingly simple and innocent questions. In the following days, a macabre series of disturbing events occurs. After Montag’s wife attempts suicide, he begins to search for answers to his endless questions. Montag is subsequently called in to burn a house containing books with the rest of his crew. Although it is illegal, he takes a book hoping to find answers to his thoughts. Guy witnesses the owner voluntarily burn with her books and reasons that there must be something special hidden in the pages. When Clarisse disappears and his pilfering is discovered, Montag must run for his life in a desperate scramble to uncover the world hidden from his sight. 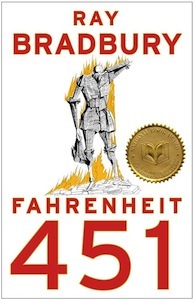 Fahrenheit 451 has been hailed as a literary masterpiece and is considered to be Ray Bradbury’s best work. The novel is abundant with foreshadowing, irony, intriguing themes and motifs, and literary references to the Bible. The plot itself was difficult to fully understand by just reading the words, and as a result I often had to look beyond the surface to notice details that I would not have noticed before. However, the characters were hard to relate to and I found it arduous to like them. Moreover, Bradbury’s writing style made the story struggle with clarity and the plotline was extremely difficult to follow as it felt hazy and far-away. Fahrenheit 451 conveys a forceful idea about literature with its depiction of a man that would sacrifice his marriage, home, money, and others’ life for books. Fahrenheit 451 contains relatively simple vocabulary words and is suitable for ages eleven and up. A compelling and prophetic novel, Fahrenheit 451 is easily one of the best books to date. I would rate Fahrenheit 451 eight out of ten stars. 1. How does Montag feel about his job initially? 2. What distinguishes Clarisse from other people? 3. What does Clarisse mean when she tells Montag that he doesn’t seem like he is fit to be a fireman? 4. What does the Hound’s hostility to Montag imply or foreshadow? 5. What does the author suggest when Beatty is shown to understand what the old lady said? 6. Why does society idolize fire? 7. What does Montag’s resolve to “never come in again” show? 8. What does the memory about the sieve and the sand mean? 9. Why is Beatty using literature to talk to Montag so powerful? 10. What does Faber reading the Book of Job foreshadow? 11. Why does Mildred betray Montag? 12. What was the significance of the rain at Faber’s house? 13. Why is Guy becoming “fully aware of his whole body” important? 14. What does it mean when the city only receives “ashes” from Montag? 15. What does the quote Montag recites mean?